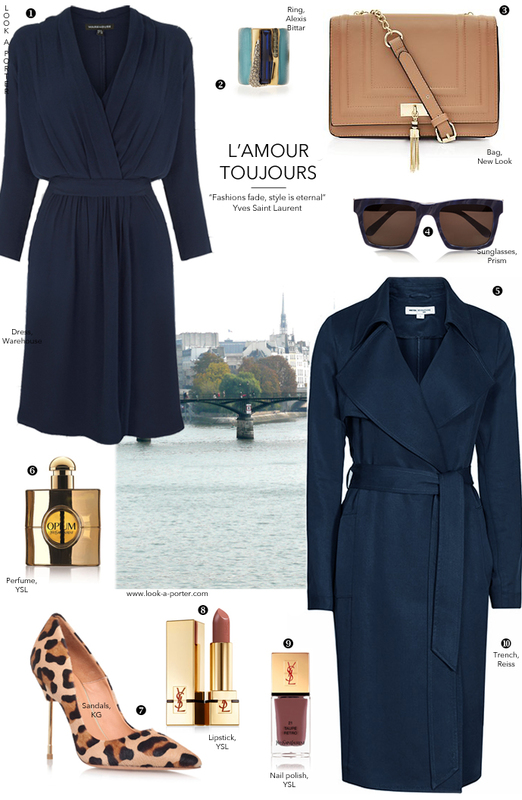 One more Yves Saint Laurent-inspired outfit idea featuring already familiar blue dress. Today, however, I dressed my imaginary girl in what I'd consider a very classic Saint Laurent look, with a node to the other designer muse, Betty Catroux. The result is a mixture of trench and dress in one of Yves's favourite colours, plus a few pieces I thought Betty would approve: although she's always been known for her love of minimalism, monochromatic hues and borrowed-from-the-boys style, I couldn't help but noticed how this stunning Parisienne always added a couple of finishing touches to make the look unique - whether it was a touch of animal print or statement ring, plus, always-always-always, a pair of oh-so-very-Yves sunglasses. HOW do you find all these pieces together,Natalia,dear? !